Entering Cuero from the north on Hwy 183 / 77A. The road becomes Esplanade. On both sides of the road are palms, oaks and yucca representative of the varied vegetation of DeWitt County. The county, we are told, contains the most varied soil types of any county in Texas. As it was explained to us, "DeWitt County is to soil what Llano County is to rock." Esplanade is one of Cuero's two major streets; the other being Broadway. Main Street at Esplanade is the heart of the Historic Downtown Business District and begins the area of antique and specialty shops. Resplendent with 19th century architecture, this is a wonderful place to take a stroll and soak up the local flavor. The Chamber of Commerce is located three blocks south of Broadway at 124 E. Church Street (361-275-2112) in the beautiful 1915 post office building. 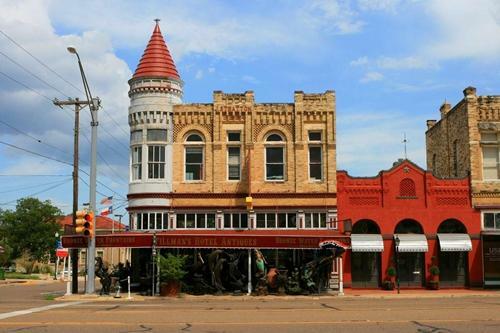 Cuero has over 50 buildings on the National Register and three Historic Districts. The history of Cuero is interwoven with that of Indianola. Many Cueroites moved here from there, dismantling their homes and hauling them by ox-cart to escape the hurricanes that obliterated that one time rival to Galveston. The DeWitt County Museum, 312 Broadway, housed in the Bates-Sheppard Home, is among those that were shipped board by board and reconstructed in Cuero after the 1886 hurricane. The museum is also home to the DeWitt County Wildflower Association during the month of April. The DeWitt County Museum, arranging bus tours and furnishing guides for visitors is just a small part of what they do. Every year they publish the Lanes and Byways April Journal, an informative guide on the best viewing areas and anything and everything pertaining to wildflowers. Texas Highways Magazine's June 1998 issue noted the discovery of a new wildflower by Derek Muschalek, a local naturalist who became interested in flowers from his interest in birds and now we hear he is paying attention to butterflies. Could this be the man to fill Roy Bedechek's long vacant shoes? Head south on Hwy 77 (Esplanade) and cross the railroad tracks. You will see a sign for Arneckeville. Follow the arrow and watch for the signs on your right. There will be two of them. After leaving the Cuero city limits you'll notice a few miles of feathery trees on your right and down. These are Cypress trees along the banks of the Guadalupe River. After you've gone about seven miles from town, start looking for a sign on your right for Zion Church Road. The sign is next to a cattle guard, the first of three that you will cross to reach the cemetery and church. 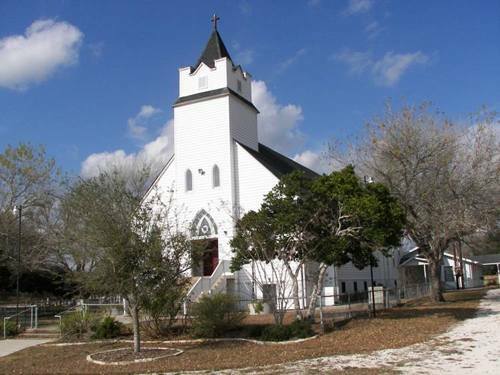 This Lutheran Church and its cemetery has been the anchor of this German settlement since 1868. If it looks familiar, you may have seen it in statewide publications. It is a favorite of photographers. Yorktown is southwest of Cuero on Hwy 72 and in addition to their own wildflower program there's a hiking/biking trail along Coletto Creek next to the Yorktown Historical Museum in the historic 1848 Eckhardt Building. Inside the museum see the piano that survived both Indianola hurricanes. On the corner of Main and Eckhardt Streets. An easy drive with some pleasant diversions, Hwy 183 takes you right to Cuero without switching highways. 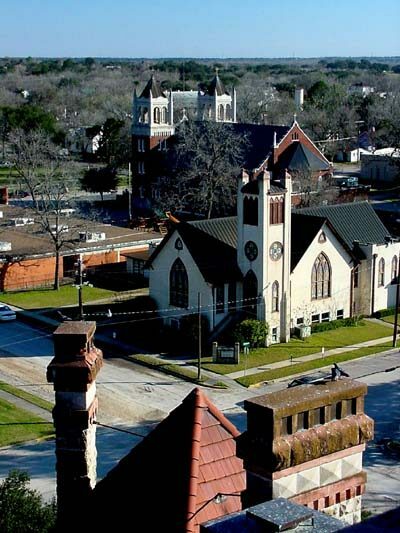 Major towns of Lockhart and Gonzales are conveniently placed at 1/3 intervals. Lockhart is barely 30 minutes from Austin so you may want to eat a light breakfast to sample some of the barbecue that Lockhart is famous for. Two of these restaurants are within one block of the square and one is right on the highway just South of town. The impressive 1894 courthouse is one designed by Alfred Giles of blue limestone trimmed with red Pecos sandstone. The Chamber of Commerce has a complete brochure, with points of interest as well as a good city map. On the way to Gonzales you'll pass through Luling, a textbook example of a railroad town, famous for its Annual Watermelon Thump (June, last Thur-Sat). The Luling Chamber of Commerce address is 421 E. Davis, Luling, TX 78648. 830-875-3214. Continue past I-10 to Gonzales, "The Lexington of Texas". I don't know how this motto sits with the citizens of the town of Lexington in Lee County. But we all know (or should know) what they mean. Lots of history here. One of J. Reily Gordon's courthouses from 1894 graces the center of town and the old jail houses the County Historical Museum. This city is certainly a destination in itself. Their Chamber's number is 830-672-6532. 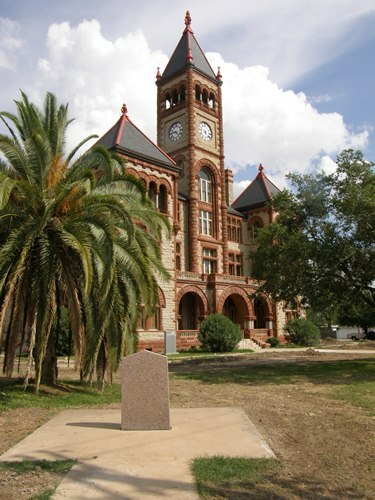 You can drive directly to Cuero on Hwy 87 which is a pleasant, unhurried and scenic trip or if you've read or seen "True Women" by Janice Woods-Windle you may decide to take I-10 East to old US 90 and enter Seguin which is the setting for the popular book and TV movie. The book has certainly generated interest here and tour brochures are available to show homes and sites featured in the book. Contact the Seguin Chamber at 427 N. Austin, 78155. 830-379-6382. From Seguin continue on Hwy 90 to Gonzales. Lots of history here. One of J. Reily Gordon's courthouses from 1894 graces the center of town and the old jail houses the County Historical Museum. Contact Gonzales Chamber of Commerce at 830-672-65632. At Gonzales you'll take Hwy 183 South for the last one third of the trip. Your information on Cuero is very helpful to this Chamber doing its job. ... We have more to offer the tourist today than we did three years ago ... Turkeyfest is the second weekend of October and Ruby Begonia, our racing turkey, can now claim 'Fastest Turkey in the World' as she beat Paycheck, Worthington, MN's bird last October. 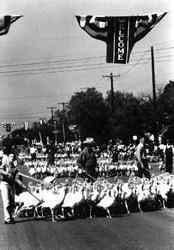 Our Cuero Heritage Museum, located with the Chamber in the Federal Building, now has a permanent exhibit 'Cuero Talks Turkey' which features pictures and memorabilia from past Turkey Trots (1912 and later) and 29 years of Turkeyfest.